Hopes of finding survivors faded in quake-devastated Lombok island in Indonesia on Wednesday as a humanitarian crisis for 156,000 left homeless looms with a shortage of clean water, food, and medicine. Indonesia’s disaster mitigation agency put the death toll from Sunday’s 6.9-magnitude earthquake at 131, including two on the western neighbouring island of Bali. The agency said the figure was expected to rise. Nearly 2,500 people have been hospitalised with serious injuries. Rescue workers were finding some hamlets hard to reach because bridges and roads were torn up by the major temblor. “Teams are speaking of coming across ghost towns, villages that have essentially been abandoned,” said Matthew Cochrane of the International Federation of Red Cross and Red Crescent Societies. He added 80 percent of buildings had been damaged or destroyed. Rescuers dug through the rubble of a mosque on Wednesday where an unknown number of people were suspected buried. 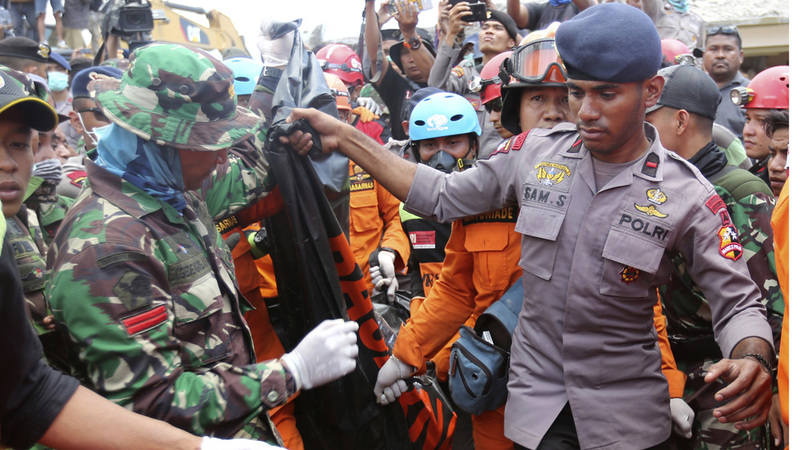 A woman’s body was recovered, said rescue worker Bagusa Ngurah. “We stood still when we first felt the earthquake, but the sway grew stronger so we tried to run before the mosque collapsed,” Muhammad, a worshipper who managed to escape, told the Metro TV. “Some of us had to smash glass windows to get out,” he said. Thousands of tourists have left Lombok since Sunday fearing further earthquakes. Lombok had already been hit by a 6.4-magnitude earthquake on July 29 that killed 17 people. Indonesia sits on the Pacific Ring of Fire and is regularly hit by major temblors. In 2004, a quake-driven tsunami off of Aceh province killed 226,000 people in 13 countries across the Indian Ocean, including more than 120,000 in Indonesia.